Talk about Yogi Berra deja vu. I haven't thought of or listened to Bride since, geez, 1991's Kinetic Faith or was it 1994's Scarecrow Messiah? What I do remember is that early on, in those early days of the rise of Christian metal, Bride was different than most everybody else. Typical of the day, as it remains to this day, most bands were sorry rip offs of their secular counterparts which just threw in 'Jesus' to make parents and church youth pastors happy. Genuine musical creativity was sacrificed at the altar of a convenient substitute for the Christian ghetto. Even though early works like Show No Mercy and Live to Die waded ankle deep in the secular currents of the time, Bride still tended to be different, and therefore misunderstood and unappreciated by mainstream Christian media. I think history may repeat itself with their latest work Tsar Bomba. Even with a few modern nuances, Tsar Bomba doesn't necessary sound like anything else out there. I can't speak for modern Christian music because for the sake of reason and sanity I gave up on the it's xerox copy of it's unregenerate cousins years ago. Yet compared to the larger secular scenario, Bride could hold their own against the best progressive melodic rock and metal going. And that's what Tsar Bomba truly is, progressive creative music. It's a delightfully full work with seventeen diverse and flavorful pieces. The Thompson brothers know how to weave the innovative and eclectic with a strong melody and crafty hook as Industrial Christ proves. But across three songs, like We Are Together, Never, and Bride moves between catchy, melodic rock to heavier prog rock to anthemic hard rock. Nothing Means Anything to Me, the premier piece, displays all the diversity found on this disc in one magnificent song. Three instrumental segues fill this work featuring the fine fret work of original Bride guitarist Steve Osbourne. Lyrically, Christian themes are invoked with enough ingenuity to be both overt and enigmatic. Overall, Tsar Bomba delivers a rich tapestry of creative progressive rock with enough hooks and swerves to keep you greatly entertained. 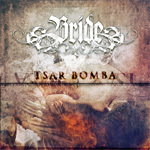 On Tsar Bomba Bride, clever and unpredictable Christian rockers, delivers a rich tapestry of creative progressive rock with enough hooks and swerves to keep you greatly entertained.